Refugees returning home. Photo taken from Jornal de Angola, June 30, 2012 edition. For the approximately 600,000 Angolans who fled to neighboring countries during the years of war, June 30th was the last day for them to repatriate back to Angola in an organized operation. Those who remain in exile have now lost their refugee status according to UNHCR, the UN Refugee Agency. Since peace in 2002, UNHCR has been assisting the government to help returning Angolans; they also work with asylum seekers and refugees who over the years have found their way into Angola. Approximately 19,000 have been recorded so far but that figure is expected to double by the time the Migration and Foreigners Services (SME) and UNHCR finish their registration program. 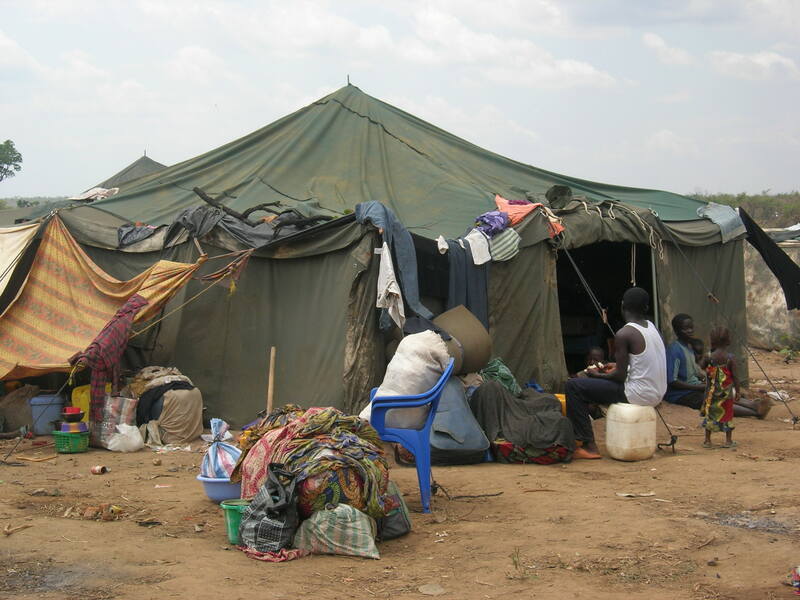 The majority of refugees inside Angola are Congolese including some who have been here for more than 40 years. The Angola Field Group invites you to view the recently produced video “Life as a Refugee in Angola” which will be introduced by Zelmira Sinclair, the UNHCR Acting Representative, Thursday July 19 at 8:00PM at the Viking Club. Zelmira, who is on her second assignment to Angola, is a Senior Protection Officer and will give a brief update on the repatriation program and the UN’s work with refugees inside Angola. She is an Attorney at Law, and holds a Master of Laws degree in Public International Law from the Lund University in Sweden. The video was produced by Italian Palestinian film maker Kami Farez. For more background details see: http://www.unhcr.ca/news/2012-06-08.htm. In close cooperation with the Viking Club, this event is offered free of charge. Alcoholic and non-alcoholic beverages and snacks are sold at the bar, coupons must be purchased. The Viking Bar opens at 7:30 PM. If you would like to have a map showing the location of the Viking Club, click here. The Viking Club is on the main floor of the former Swedish Building at Rua Marien N”Guabi, No 118 in Maianga, across the street from the new Panela de Barra restaurant. The Angola Field Group invites you to: ‘UNHCR in Angola, past achievements and current challenges‘, at the Viking Club, Thursday, November 26, 8:00 PM. The UNHCR – the United Nations High Commissioner for Refugees, has been operating in Angola since 1976. As a leading UN operational humanitarian agency, it has assisted Angola to meet the challenges of mass displacement, emergency humanitarian situations, the repatriation of hundreds of thousands of refugees, the establishment of a functioning national asylum system, and the need to develop a modern migration management system. Today, UNHCR is also playing its role in the emergency response to the recent mass expulsion of Angolan refugees from the DRC and helping the Government prepare an operational plan to bring home the tens of thousands of Angolan refugees that still remain in the DRC and other neighbouring countries. The presentation will illustrate the above and how UNHCR works with refugees, asylum seekers and other vulnerable displaced people not only in theory but in practice. Bohdan Nahajlo has been the UNHCR Representative in Angola since September 2008. Previously he was UNHCR’s Representative in Azerbaijan and Belarus and worked extensively on forced displacement challenges in the countries of the former Soviet Union. British born and educated, before he joined UNHCR in 1994 he was a writer and a journalist. The author of two books and numerous articles and reports, he was a regular contributor to the Spectator, New Statesman and The Times. He began his professional career after postgraduate studies at the London School of Economics as a Researcher on the USSR for Amnesty International. Everybody is welcome to attend this presentation. In close cooperation with the Viking Club, this event is offered free of charge. Alcoholic and non-alcoholic beverages are sold at the bar, $3.00 each. For sale, books about Angola, in English and just in time for Christmas, Huambo Dolls will be on sale. For a location map of the Viking Club visit our Join Us page. The club is on the main floor of the ‘Predio Maianga’ formerly known as the Swedish Building, at Rua Marien N”Guabi, No 118 in Maianga, across the street from the new Panela de Barra restaurant. Angolan refugees continue to flee from the DRC. Photo courtesy Yolande Ditewig.